Umag, small town and port on the northwestern coast of Istria. Umag is a city of tourism and sport. It is especially known as a sports center in Istria because it has been a host of world famous ATP tournaments, and hosts a number of stars of world tennis. Ever since the discovery of the ancient times of Roman nobles who had decided to appropriate it as his summer residence. Splendor, pageantry and glamor of those times is reflected today in the Venetian houses in the old town is rich.Only 40 kilometers away from Trieste, 150 from Ljubljana and 50 nautical miles from the beautiful Venice - is a favorite holiday for many tourists, with exceptional hiking opportunities. And the hinterland of Umag is hiding so far little-known tourist attractions, such as mountain climbing, spelunking and other activities for adventure enthusiasts..
Sandy Bay is a modern and relatively new settlement, established only thirty years. It was discovered by bathers who became captivated by the natural sandy beach which dominates the area between two peninsulas, hence the name of this place. Safe haven otrkili the sailors, seeking to secure the well-known summer nevera.Tokom years this place had more tourists which visited the mother and the natural netaknutost. Today, Sandy Bay has 350 inhabitants.Long promenade along the shore below the town has many restaurants, bars, shops and pastry shops. There is a doctor's office and a beauty salon. For more interesting place by the marina, which offers the possibility of renting yachts. Many private rooms and apartments are a good choice for your pleasant vacation. Definitely a place for enjoyment and quality holidays. Ližnjan place is a small fishing village near Medulin, only 2 kilometers. Ližnjan especially traditional fishing and agricultural town. It has a beautiful 28 km long coastline which is dotted with natural rocky beaches, and in front of the place offers a nice beach. Banjole place is a small fishing village with a naturally protected harbor. Was established in Roman times, and today has about 700 inhabitants. The town is located on a small. Locals are still tied to the sea, so that fresh fish everyday gift. 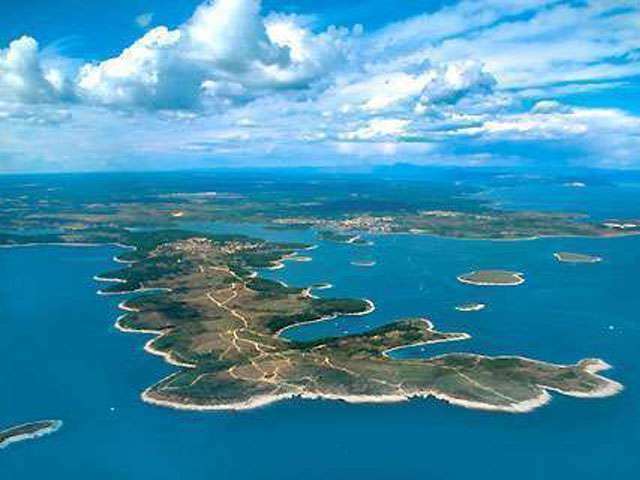 Vinkuran place is situated in the southwestern part of Istria, near Pula. Located in the bay above Vinkuranskom Solin, but the place has a lovely sheltered beach obraslu pine trees. Here you will find peace and relaxation with clear water and beautiful and natural beach. Pomer is a town located in the southern part of Istria, 8 km southeast of Pula. Located above a shallow bay Pomer. The bay is suitable for the cultivation of oysters and mussels. Nearby, in a pine forest, restored the camp where there are soccer and volleyball court, for all sports lovers. Before the camp there is a marina with 250 berths and 50 dry berths, and servicing. City Premantura, Runtianum Roman name, is located on the southernmost point of the peninsula of Istria, from Pula, about 10 km. Premantura has 845 residents and 402 male and 443 female. Premanture natives actually have a Dalmatian origin. Escape the invasion of the Turks in Dalmatia in the 14th and 15 century, responsible for the population of this place. Premantura was built on the ruins of the old Illyrian-Roman settlement, and has been mentioned about 1300 year. Štinjan town situated on the southwestern end of the Istrian peninsula and near Pula, in a nice Štinjanskoj bay. Small and peaceful tourist destination, has developed 700 m from the central beach surrounded by pine trees, and is extremely suitable for family holidays. In addition to the main beach you can swim in the surrounding smaller bays. Barbariga place is a little quiet place near Pula and Rovinja.Netaknuta nature, naturally beautiful beaches, clear waters and restaurants are always full of fresh fish are just some of the trump why tourists again and again vraćaju.Od accommodation that is situated holiday resort with suites and rooms. An ideal place for rest from noise and daily traffic jams. Peroj is a village in Istria, located on the southwestern part of the Istria peninsula near the town of Pula and Brijuni. peroj is located 10 km from the largest Istrian city of Pula. Peroj residents are particularly proud of the quality of its wine, olive oil and other local indigenous products. Peroj is vrloz interesting archaeological site where you will meet valuable Roman archaeological sites. In Peroj you can relax without the noise urboanog living. On the beautiful coast of Istria, just underneath the Lim canal is the most romantic place in the Mediterranean! City of Rovinj is the right destination for all of you who long for the sentimental atmosphere of the times irretrievably past. In the Mediterranean, you can find it here, in a city that is his romantic life began on the island which is a confined space led to the construction of built houses, narrow streets and small squares, still untouched modern urbanism.